It is with great pleasure that I present issue No. 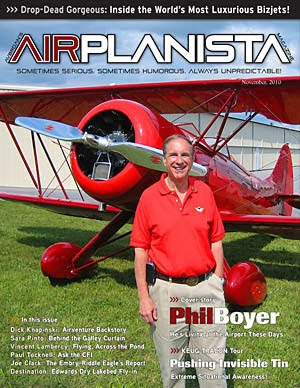 2 of Airplanista Magazine. The response from the aviation community has been both overwhelming and humbling, and it made producing this second issue all that much more rewarding. When this idea came about, I projected a goal of about 1,000 readers for the first month’s issue, based on the average traffic that had visited my blog for years. Airplanista was formally launched on October 1, and hit that projection...in the first 24 hours! With the help of some great national press, I was elated to see readership swell quickly. At one point, the magazine was receiving 75 reader/views...a minute! Within the first week, we had received eight times our monthly goal, and readership continued to climb solidly throughout the month. We finished October with over 11,000 readers and 190,000 individual page views! This massive underestimation of readership proves that the aviation community was hungry for something new and different in aviation publications. When you think about it, for far too long, there really hasn’t been anything new in the way of aviation journalism coming to market for the aviation consumer. The model we have created to offer Airplanista free and easily accessible on the Internet is helping to make the magazine even more popular than we had envisioned. What I’m hearing is that people love the way Airplanista reads like a print magazine, is priced like a blog, and features the clickable hyperlinks like a website. I refer to this project as “old school journalism meets new media buzz” because it still takes solid J-school grunt work and intricate page layout skills to produce a magazine that is delivered via a slick digital process. And it can be easily shared with family, friends and colleagues with the click of your mouse. With each day that this magazine is in existence, I learn something new about you, the aviation reader. Of note is the way people have emailed in their story ideas, some which you will see in future issues. I’m also impressed with the way people have embraced the social media aspect of Airplanista, as the positive Facebook posts and Tweets are far too numerous to count. Our focus now is to present great content and build a solid readership base. Both things will need to be in place when we begin selling display ads for 2011, something that is critical to the future production of this magazine. So to everyone who read the first issue and everyone currently reading this issue...thank you! You’re part of something shiny and new that we’re building from scratch, and it’s truly a wonderful thing.